Daily Fantasy Basketball – An Overview Of How To Play The Game! 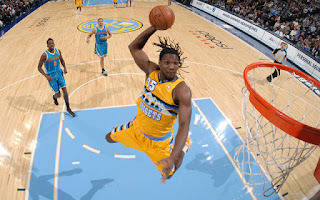 Last night was my BEST NIGHT EVER thanks to Kenneth Faried’s 26 points and 25 rebounds!!! I have been playing fantasy basketball for over 16 years! As a HUGE basketball fan, it is so much fun! Building a team of players and competing against others is truly exciting! However, I recently came across a WHOLE NEW way to play and enjoy fantasy basketball and it has been nothing short of AMAZING! It’s called DAILY fantasy basketball and I believe that this new trend is going to revolutionize not only how we play fantasy sports, but how we consume sports as well! So the concept of fantasy basketball is simple. You compete against them scoring points based upon those players ACTUAL in game performance. The team that scores the most points wins. Traditionally, fantasy basketball is played over the course of an entire NBA season. You draft a team at the beginning of the season. Then you compete against other teams throughout the season. You can trade players, sign free agents and waive players. You can play strictly for fun and bragging rights or you can also play for cash and win money playing the game as well. While season long fantasy basketball is fun, there are some slight disadvantages. One of the biggest disadvantages is that it is a VERY long season. Like the real NBA it starts in November and it continues until April. The challenge with the length of the season is that after a while, some teams get so far behind they have no chance of winning. When that happens it can be kind of boring for the team owner and they might not be as excited to set lineups and stay engaged. This also takes some fun away from the other league participants as there is one less player being active. This is where daily fantasy basketball comes into play. Daily fantasy basketball takes the same concept that season long fantasy basketball builds upon. However, it compresses time frames. So instead of competing over the course of an entire season, you compete over the course of a single day. You pick your team. Your team competes against another team or other teams. At the end of the night the team with the most points wins. Like season long, you can play strictly for fun and bragging rights. However you can also play for cash. Playing for cash brings up a very interesting dynamic in the daily game. In season long, you have to wait months to see if you are the person that ends up winning the cash. In daily fantasy you don’t have to wait months. You find out THAT VERY NIGHT! There are even free rolls where you can play for free and STILL win cash prizes as well. It’s a truly incredible concept. The first step is to pick your team. There are several ways this can be done and there are multiple formats. Every player is allotted a specific budget. That budget is used for the purpose of drafting players onto your team. Each player playing that night is assigned a dollar amount. The top players have the highest dollar amounts. The bench warmers have the lowest. Your job is to spend this budget on players to make up your fantasy team with the hope that your team is going to score the most points. You can pick any player you want. Other players can too. So it’s possible that you and someone else both draft Kobe Bryant. If that happens, you will both score the same amount of points from Kobe and whatever players you have that are different will determine who has the higher score. The key to picking a successful team is to maximize your budget by finding the best players and spending the least amount of money. Sometimes, that’s going to involve spending the big money on the superstars and hoping that they are worth it. That’s what I did on Christmas night when I spent $12,000 of my $50,000 team budget on Russell Westbrook. With Kevin Durant out and it being a nationwide television game on Christmas night, I was expecting Westbrook to have a BIG game. So I spent the money and he delivered in a BIG way, scoring 34 points, grabbing 5 rebounds, dishing out 11 assists and getting 5 steals as well. This allowed me to get 66.25 points and helped my team win most of our matchups that night. Other times, that’s going to involve finding players who are priced lower, but put up HUGE performances. That’s what I did tonight to win. I really liked Kenneth Faried’s chances of putting up a good performance against the Minnesota Timberwolves who are the worst team in the Western Conference. He was priced at only $6,000 tonight. That’s HALF of what I paid for Russell Westbrook on Christmas night. So I took Faried and he showed up in a BIG way, scoring 26 points, grabbing 25 rebounds and getting 3 assists. That was good for 61.25 points and helped my team win pretty much ALL of our matchups last night. In fact, my team did so well last night, I came $24 short of matching what I made working a FULL DAY on my job. I made this lineup ON MY LUNCH BREAK! So that’s how Daily Fantasy Basketball works! If you would like to play, the first step is to sign up on a website to play. It is legal to play in all 50 states in the United States, however, there are a couple of states that you can only play for free. Most states though, you can play for money because they don’t consider fantasy sports gambling. My favorite site to play basketball on is Draftkings. They are offering a 100% bonus match so if you sign up and make a deposit, they will match your deposits in bonus money that they will load into your account as you continue to play games. Click here to sign up on Draftkings. They are currently offering a free contest right now when you make your first deposit. Who knows? Maybe you might play against me one day! 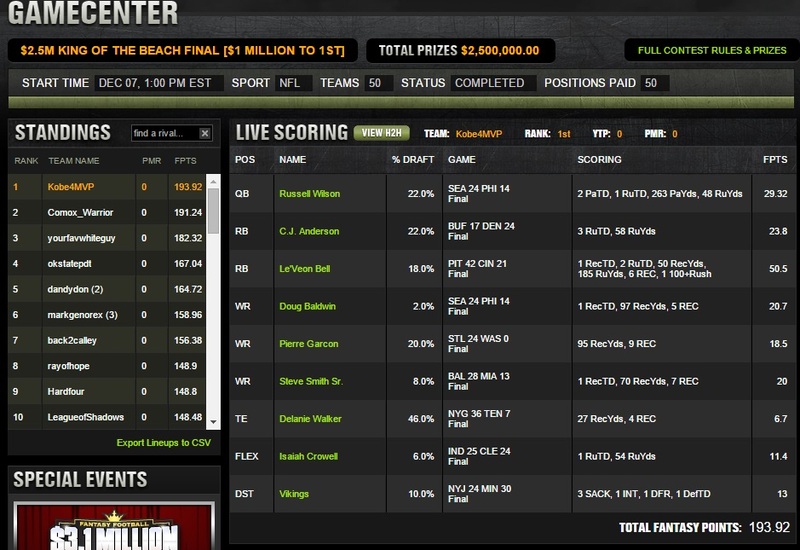 What Does A Million Dollar Fantasy Football Lineup Look Like? 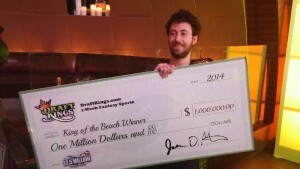 King of the Beach $1,000,000 Fantasy Football Prize with Draftkings! Yesterday, 50 fantasy football players competed live in the Atlantis Resort in the Bahamas for a grand prize of One Million Dollars! The winners are actually a couple of long time friends, Eytan and Aaron! They decided to partner up together and build fantasy sports teams together. Interestingly enough, these two gentlemen are actually better on the basketball side of the daily fantasy sports world. However, it just goes to show that if you put together the right lineup on the right day and the right time, you can win it all! They have been playing fantasy sports professionally now for almost a year and a half and now they get to add a million dollars to their career earnings, not counting whatever money they have made up until now. That’s pretty amazing! Imagine making a 7 figure income picking out professional athletes? That’s got to be a dream come true for any die hard sports fan! 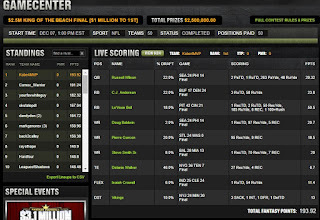 So what does a million dollar fantasy football lineup look like? Here is the lineup Eytan and Aaron used to earn themselves a million dollars yesterday! So in this case, the million dollar lineup was formed by investing most of the money in the Quarterback and Running back positions. These top tier players all performed well, especially in the case of Le’Von Bell, whose performance was nothing short of spectacular. In order to be able to afford these players, the money was saved by acquiring low priced players at the receiving and tight end positions, targeting guys who they believed would perform at a minimum of 4 times their price/production value. With the exception of the TE and the FLEX position, they were completely correct on their bargain players. All of them scored at a minimum above 4 times their price/production value. When you build a team that has 3 studs who perform, combined with solid undervalued picks, you have a recipe for a winning team. In the case of this team in particular, Eytan and Aaron had a MILLION dollar recipe.